Discover why every company needs a great human resources department and how you can build one that will help you grow your business. When I initially applied for my role at HubSpot, I was immediately blown away by the hiring manager I was working with. She was professional, incredibly informative, and experienced. She had the answer to every question I had about the company, the role I was being interviewed for, and HubSpot’s culture. From the first point of contact with this HubSpot employee and throughout my onboarding process, she was the prime example of what I believed a person in human resources should be. Even now, she checks in with me to ask how I’m doing and how my job is going when I see her around the office. Remarkable Human Resources (HR) employees are critical at every company. They handle all employee relations so you can focus on your side of the business. Before we discuss more reasons why your company needs an impactful HR department and how you can go about building one, let's talk more about what human resources actually means. Human resources is the person or group of people at a company who manages all things, or “resources”, related to its employees. This includes — but is not limited to — hiring, maintaining a budget, recruiting, managing benefits, ensuring employee satisfaction, implementing a company culture, and training new hires. Based on this definition alone, you can see how it would be difficult to run your operation successfully without the assistance HR provides. That’s why even small and medium-sized businesses (SMBs) have HR departments with employees who oversee all management, engagement, and development between the company and its employees. HR departments exist to support you and your employees so you can continue doing your jobs successfully. The work and responsibilities of a human resources employee will touch a large portion of your business every day. So what does that mean for you? Let's review some of the most common responsibilities these employees have so you can better understand the impact HR will have on your company. HR handles the employee-to-employee relationships as well as the employee-to-company relationship. This means they work to develop positive interactions and treatment among all employees within your company so they feel good about coming to work, committed to their jobs, and invested in the growth of the business. Whether it’s a personal matter or a work-related issue, human resources will handle all issues with care and keep the best interest of the both your company and employee in mind. Your HR department will handle your entire staffing plan — meaning they’ll identify the gaps in your current employee structure and fill them by acquiring new talent. They’re also in charge of firing any existing talent that isn’t meeting company standards. Your company’s HR team will ensure you have the right people to help you grow your business. Once your employees have begun work, you’ll want to make sure they’re excited to come to the office every day and add value to your company — their excitement is directly related to their level of job satisfaction. If your employees are happy in their roles, feel as though they can grow at your company, and can change departments down the road if they choose to, they’re more likely to be productive members of the team. Your HR team ensures your employees really do feel satisfied in their roles, and will work with them if they feel unhappy or unsatisfied at any point in time. Your HR department will handle the amount and type of employee benefits your company offers. Providing good employee benefits is critical to the success of your business because they’re proven to attract and retain talent as well as increase employee productivity. Benefits keep employees satisfied by giving them a variety of perks and and making them feel secure in their roles. 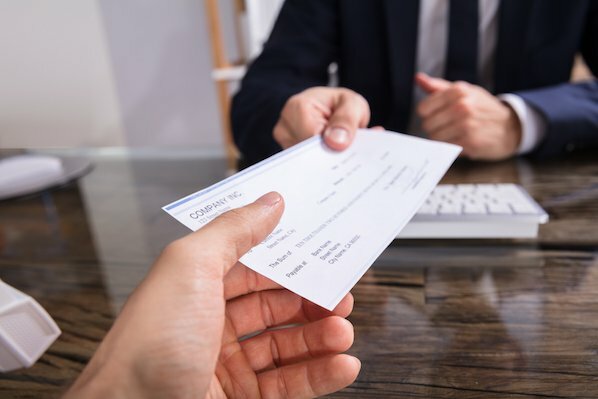 All payroll and compensation work is managed by HR — this includes employee salaries, payment schedules, W2s, and all other tax-related paperwork. If an employee is offered a promotion, or if employees are given bonuses, HR will handle all changes in their regular payment schedules. Your HR department will help you create, distribute, and maintain your company’s business plan — this serves as an overview of your company’s organizational structure. 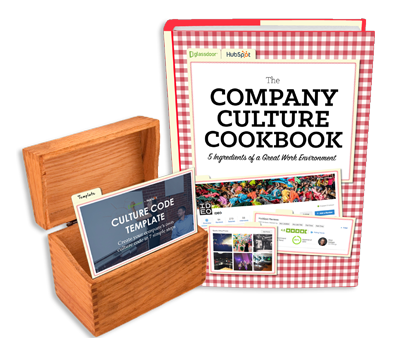 It covers your company’s philosophy and culture code, the way in which you manage your employees, and how you’ll distribute your resources. When an employee is hired, HR will often take them through the necessary training they need prior to diving into their everyday tasks. Whether it’s one day or six weeks, new hire training is critical to making that person feel comfortable in their new role. It’s also a great way to set expectations early on and get them prepared so they can begin making an impact as quickly as possible. HR is in charge of helping you create and maintain your company culture — this includes your philosophy, mission statement, and work environment. It also includes your company’s ethical standards, values, goals, and expectations. HR may implement programming, activities, check-ins, or events at your office so your employees can learn and develop a better understanding of the culture. Your HR team will assist you in creating a healthy and safe work environment for all employees. Their role in this includes setting health and safety standards in the office, communicating these standards to all employees, and upholding them as the business grows. These health and safety standards should be written so they can be easily referenced at any point in someone’s time at your company. A lot of your company’s administrative work is handled by HR. This includes paperwork related to federal and state tax laws, job applications, time-keeping and payroll information, and employee contracts. We’ve put together a list of 10 steps — not listed in any specific order — you should take to build a successful HR department. Whether you begin working through this list with or without your company’s first (or first few) human resources employee(s), all 10 items on this list should be thoughtfully considered. Create a company-wide staffing plan so you can identify all positions you’ll need to fill with your new hires. This may also include moving current employees into new roles or even removing employees and/ or their roles entirely from the company. You’ll need a budget for your human resources department — this will cover the costs of building the department and hiring your HR team. The budget will also go to company-wide programming, and culture and team building activities HR may organize. You’ll need to ensure you have payroll and compensation plans in place for all types and levels of employees. Your employees are going to want to know how, when, and the frequency in which they’re going to be paid the moment they receive their job offer. You’ll also need this information to determine salary ranges for all of your employees. Job descriptions posted on your website and job sites such as LinkedIn and Glassdoor are how you’ll attract applicants. 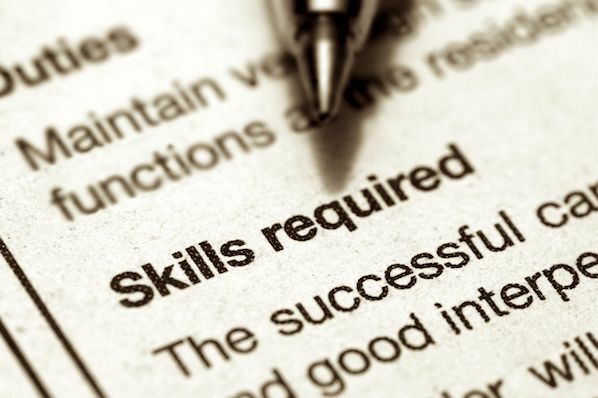 You’ll want to create job descriptions for all of the HR roles you need to hire for. Then, as you fill some of these HR openings, those new hires should be able to assist you in creating all other job descriptions for your growing company. A clear and thorough benefits plan is crucial when trying to attract and retain talent. You’ll want to lay out all of the benefits you offer to your new hires so they can feel good about their decision to join your team as well as secure and supported in their roles. 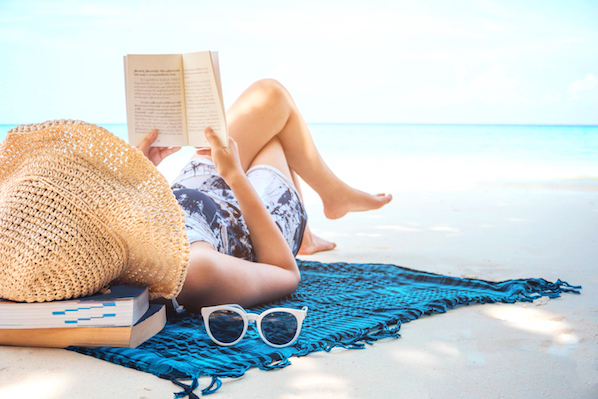 An employee handbook (whether it’s print or digital) is a great way to set clear expectations from day one about workplace behavior, safety, health, and culture. Your handbook should include answers to all the questions your employees may have about these topics — and any others you see fit — as they go through training and begin work at your company. Your employees are most likely in the office for approximately eight hours per day — meaning it needs to be a healthy and safe place for them to spend large amounts of time. If one of your employees ever felt unsafe or at risk of mental or physical harm at the office, it’d be very difficult to expect them to be a productive worker. To avoid this, you should set workplace health and safety standards, which you may choose to include in your employee handbook. State your safety procedures for different types of personal altercations as well as procedures for emergencies and other potential unexpected or dangerous situations so everyone can handle them appropriately. Although you may have an executive assistant who collects and organizes a lot of your company’s administrative records, there’s also plenty of documentation that should be collected, organized, and managed separately by your HR department. Some of these items may include job applications, benefit plans, tax documents, and compensation and payroll details. There are state and federal laws that require companies and their HR teams to hang specific employment posters around their offices so they’re visible to everyone who enters the space. Some of these required posters change over time, so be sure to keep up with the laws and requirements of your state and country. Employee success and satisfaction are major components of a prosperous company — without these two things, it’d be difficult to retain your best talent. You’ll want to create company-wide performance and feedback processes to ensure everyone is held to a specific standard that you and your HR team set and maintain. Employee performance evaluations should be held to ensure all employees are working up to their full potential. This time should also be spent making sure your employees are satisfied with their jobs, feel as though they can grow with your company, and enjoy being a member of your team. Now that you have a better understanding of HR’s responsibilities and how you can start building your own department, let’s review the some of the things you should try to identify in potential HR candidates, including education type and work experience. It’s no secret that a lot of people often “fall” into the human resources field. By this I mean a lot of people who end up in the field don’t necessarily go into their undergraduate education thinking they want a career in HR. If this is the case for some of your HR applicants, there are a few indicators that you’ve found a great candidate despite their educational background. HR certifications, such as the Society for Human Resource Management (SHRM) certification or one of the various others offered by the HR Certification Institute. Great work ethic, personality and ability to be strategic. It’s key to find a candidate that will represent your company well and has the adaptability to grow into their role. If you see promise, you might also provide this type of candidate with the opportunity to earn a certification and/or postgraduate education in the field as they begin work at your company. Bachelor’s degree in Human Resources Management, Business Administration, or a closely related field. Master’s degree in Human Resources or Human Resources and Employee Relations (HRER), or a closely related field such as Business Administration. Prior HR experience, whether it’s an internship or job(s) at another company. Now that we’ve covered general requirements and characteristics that you should consider looking for in your HR candidates, let’s dive into some of the actual roles you’ll need to fill within the department. We’ll start with your HR department structure. Depending on the size of your company, you may or may not need all of these positions and levels in your own HR department. 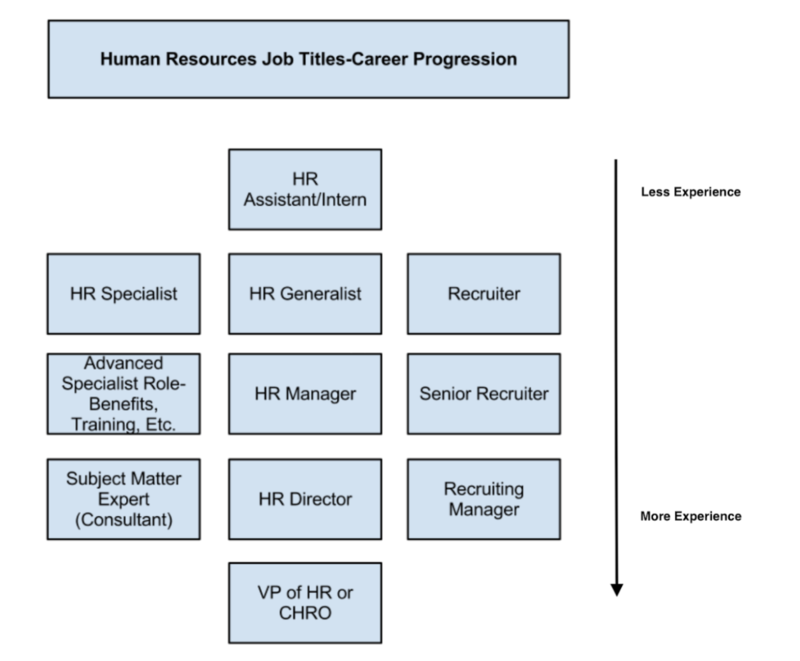 Another important thing to note is that the titles of these roles and level in which they’re placed also vary based on company, but this diagram will provide you with a general idea of an HR department structure. So what do HR employees in these roles actually do? And what are the differences between each position? We’ll cover the answers to these questions below. Entry-level HR jobs are fit for people who are in school, have recently graduated, or are entering the field for the first time. Their roles may include assistants and HR interns, specialists, generalists, or recruiters. HR assistants and HR interns are typically in charge of the administrative work — such as organizing paperwork, completing the employer portions of new hire information, and other work their higher-ups ask of them — that needs to be done so everyone else in the department can remain productive and focus on more complex tasks. HR specialists focus on one specific department or discipline within human resources. These specialties include HR development, HR management, and organizational development. Their goal is to become an expert in their chosen specialty. For example, a benefits specialist would be required to know and understand the intimate details about a company’s benefits plan and be able to explain that information to new hires and current employees. HR generalists have knowledge that covers multiple different areas of the department and its needs. People in this type of role will work on the more typical tasks you may think of when it comes to HR such as compensation, employee relations, and workplace environment. The sole job of a recruiter is to bring in impressive talent for the company. They find new people to fill the gaps in the company’s staffing plan so the business can continue to grow and remain as productive as possible. As those in HR work their way up the ranks and acquire more experience, they’ll likely move into a mid-level HR role. Examples of these jobs include advanced specialists, HR managers, and senior recruiters. An advanced specialist is typically someone who was promoted from an HR specialist role. Their work might include developing job descriptions for specific, technical roles within their specialty, and training and overseeing entry-level specialists who are also in their chosen discipline. Advanced specialists serve as a company’s high-level experts regarding their specific topic within HR. An HR manager might oversee a group of entry or even mid-level HR employees. They’ll typically handle more of the complex HR tasks such as the creation and management of company-wide policies, values, and culture. Senior recruiters function as your very own staffing service. They may oversee a team of entry-level recruiters who work to identify ideal candidates for open positions at your company. Senior recruiters may work for your company or you might hire them as a third-party service depending on your budget and resources. If someone ends up staying in the HR field for the majority of their career, they may find themselves moving into a high-level position at your company. These roles may include an HR consultant, HR director, recruiting manager, or vice president of HR chief of human resources officer (CHRO). An HR consultant is typically someone who oversees all HR administrative work and makes sure you’re meeting all company, state, and federal policies and laws. They can be subject matter experts on a particular HR-related policy. People in this role may be hired as third-party help depending on your budget and resources. If an HR manager is promoted, that person might move into an HR Director role. In most SMBs, the HR Director typically oversees all departmental activities and reports directly to the CEO. Recruiting managers oversee your company’s recruiting teams. They sign off on your staffing plan and ensure all of your role gaps are filled and talent needs are met. In a larger company, you may have a vice president of human resources or a chief human resources officer. This person reports directly to the CEO, oversees the entire HR operation, and creates overarching department goals. Having a fantastic human resources team is essential to the success of your business. Your HR department will manage your employee relations, hiring, training, career development, benefits, and company culture. Without HR, your employees simply wouldn’t be able to do their jobs. Start by thinking about the number and type of HR employees you’ll need and get started building your department so your company can continue to grow.